Come down to the Woodland Art Fair this Saturday and Sunday, August 15 and 16. We’ve made big progress on the Sheltowee Trace South map and we’ll have samples to show at our booth. 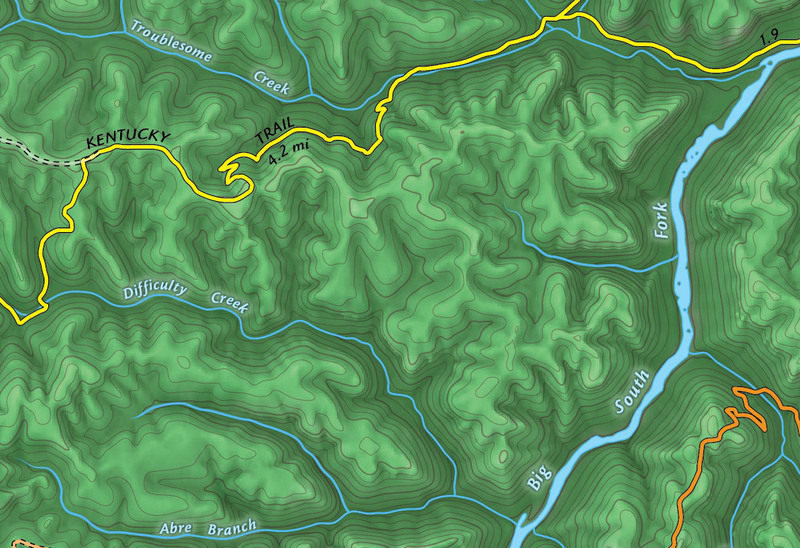 While in the same format as Sheltowee Trace North map, we’re adding an additional sheet to cover the Big South Area. The fair runs from 10 a.m. to 5 p.m., or there abouts. We’ll stay as long as you’re visiting! Our booth location and coordinates are shown on the below map. We’ll be between Troublesome and Difficulty Creeks, at least spirit! Find us on the Woodland Christian Church side of the fair at the shady bottom of the hill. 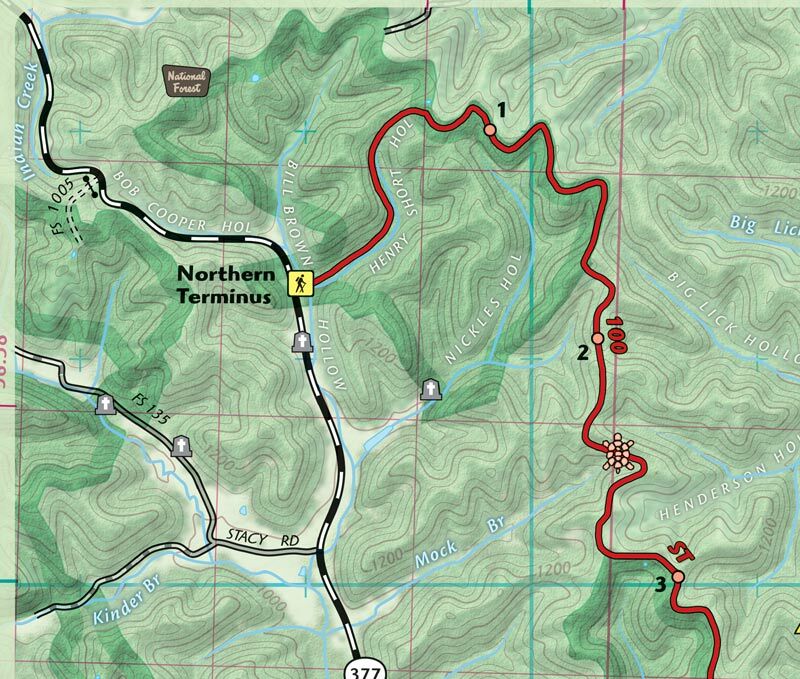 After many requests from hikers and map enthusiasts, our map that shows the ST 2009 southern alignment (Pickett State Park as southern terminus) is back in a limited edition print run. Folks called nearly everyday asking for this map. We answered with a custom map edition. While the southern terminus is now at Burnt Mill Bridge in the Big South Fork, this is the only map that shows the Sheltowee Trace between the Big South Fork and Turkey Foot. This map also shows the Kentucky Trail and long portions of the John Muir Trail, which the ST also uses. This laminated map is now for sale at $24. We’ve started an online map for the Sheltowee Trace, because it keeps getting longer with each new season. This month, it is 319 miles (and some change) long. This map is mobile compatible and will locate you on the trail if your device has GPS. Try it out and tell us what you think. The map includes the new extension from Leatherwood Ford to Honey Creek. We’re gearing up with a new online #SheltoweeMap with a participatory aspect. Keep tuned and get a map for exploring. Woodland Art Fair time, 2014! Come down to the Woodland Art Fair this Saturday and Sunday, August 16 and 17,and check out our new Sheltowee Trace North map. We have a couple neat projects in the works and would like to hear your trail adventure stories. Cover wrap of our new Sheltowee Trace Map. Click to enlarge. 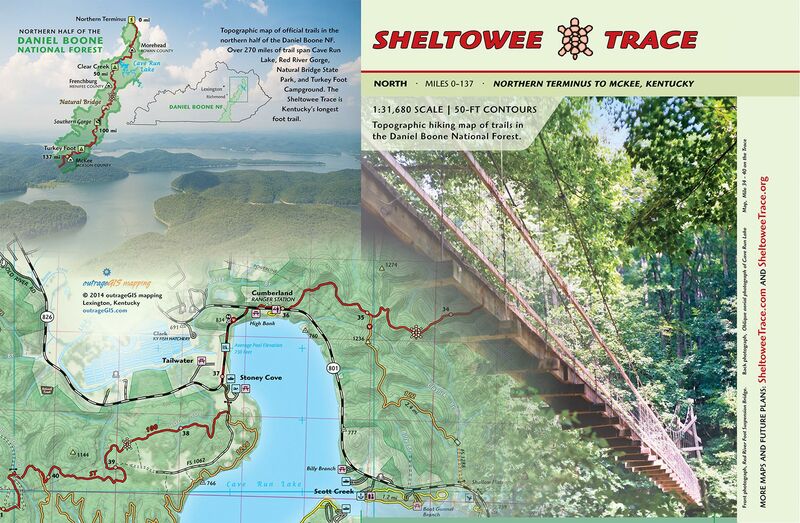 We are now printing the Sheltowee Trace North map, which covers the ST and official trails between the Northern Terminus and Mckee in Jackson County, Kentucky. That’s 138 miles of ST and 130 miles of official trail. The map is same scale as our previous ST south maps, but the sheet size has been enlarged to 19″ x 27″ and packs down to 4.5″ x 6.5″. We will also offer a lamination and heat press service to make these maps bomber in the field. A couple unique additions to this title might be useful for the serious trail enthusiast. The map is formatted to show the trail network of Cave Run Lake and Red River Gorge on single, separate sheets. The new ST reroute around Morehead and new trails in Cave Run are located. Groceries, public libraries, power lines, and pipelines are located. We’ve added 1,000 m UTM grid. What else? Lots of love and devotion for the trails of the Daniel Boone. Low resolutions drafts of the press sheets (note these previews require Flash). These have been altered in final version. The only way to see the finished map is to hold it in your hand! Just like the South ST map, when the ST leaves a sheet it has a letter in a red box as label to match the trail on the next sheet. Just follow A…B…C… for 138 miles. Thanks for the input in correcting thre above drafts! We have been working on our 3D map of the Sheltowee Trace. 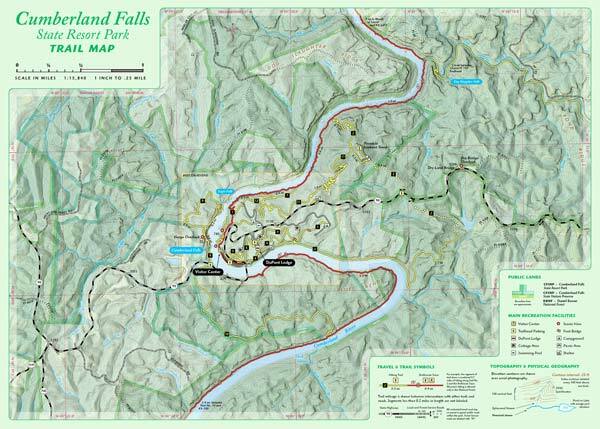 This Bird’s Eye View map shows the official forest service trails and recreation areas on a 3D map of the Pottsville Escarpment that separates the rugged Cumberland Plateau with the more rolling Bluegrass and Pennyrile regions. We encourage you to explore this map give us any feedback. We will probably print portions of the map as insets in the Sheltowee Trace north map on which we are currently working.